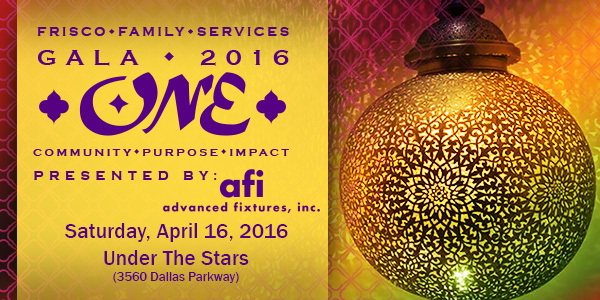 Frisco Family Services is pleased to announce Gala 2016 - ONE - ONE Community, coming together for ONE purpose, having ONE big impact, on Saturday, April 16, 2016. This year's event will be "under the stars" where guests can take in an awe-inspiring, panoramic rooftop view of this great community, from seven stories up! We are pulling out all the stops to ensure our 22nd annual gala is an experience like no other - and we want YOU to be a part of it! The evening will include an elegant, seated, six-course dinner presented by local restaurants, spectacular live and silent auctions, and dancing under the stars to the fabulous Emerald City Band! Gala 2016 will conclude with the announcement of the winner of a Luxurious Italian Getaway along with the winner of a $10,000 VISA gift card. Every day, Frisco Family Services remains committed to helping our neighbors in need - those facing hunger, homelessness or another life crisis - but we cannot do so without YOU. We invite you to make an impact in our community by supporting us as a sponsor, program advertiser and/or distinguished guest. COMMUNITY begins with CARING.